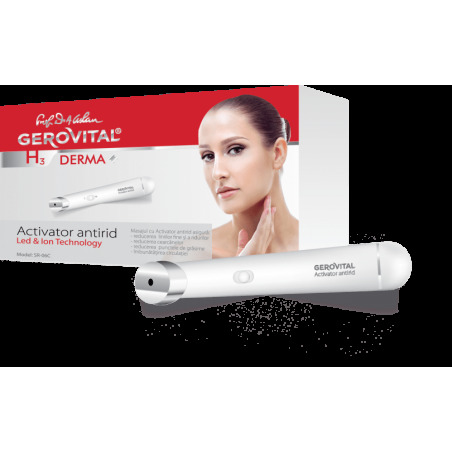 The Gerovital H3 Derma+ Anti-Wrinkle Activator (Led & Ion Technology) is an electrical device with high frequency vibration that uses advanced technology based on positive and negative ions to prevent and reduce wrinkles. 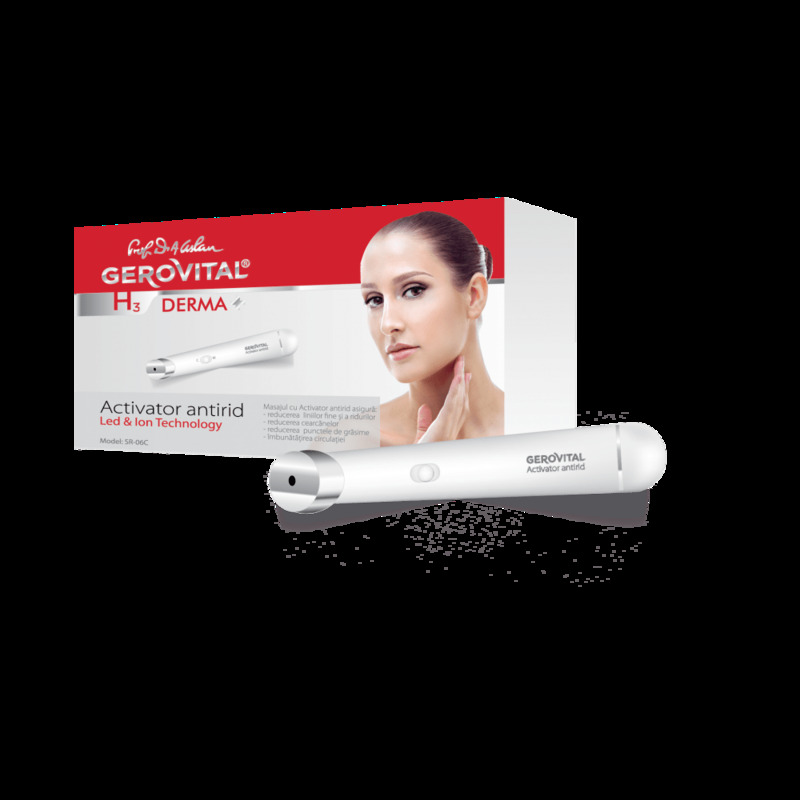 The activator provides an effective massage that improves circulation, unblocks pores, but also helps towards deeper penetration of serums, moisturizers and cleansers to brighten complexion, enhance hydration and provide anti-aging, lifting and firming results. It is portable, with simple functionality. Blue light and positive ion (+) helps to clean your face and relax cells. 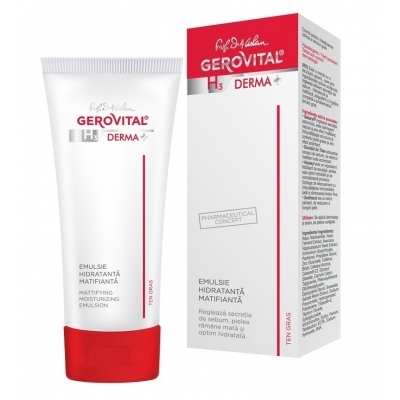 Red light and negative ion (-) is used after applying the moisturizer/serum/vial and helps deep penetration of the active principles. 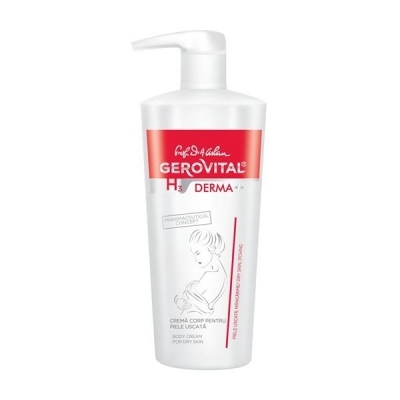 We recommend using a suitable moisturizer from the Gerovital H3 Derma+ line. Before use, remove glasses or contact lenses and jewelry. The device is used morning and evening for maximum 3 minutes. The unit will automatically turn off after 3 minutes. 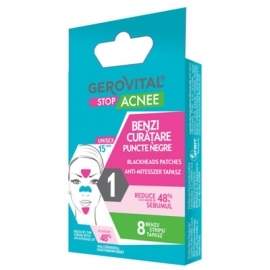 1 Complete face cleansing programme. Blue light and positive ion (+) - switch to mode "C"
Move slowly over the face. • Do not use on the eyes or eyelids. 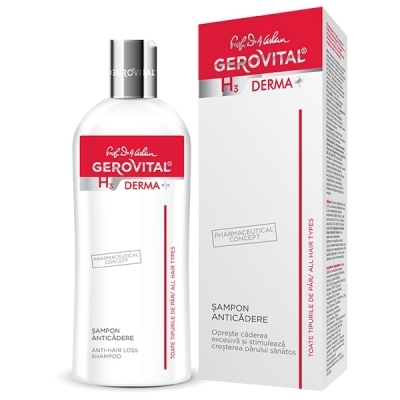 • Before using apply the Gerovital H3 Derma+ Cleansing and Make-up Removal Fluid Face and Eyes. Red light and negative ion (-) switch to mode "M"
• Do not look directly at the activator’s red light (LED). • Do not use on eyes or eyelids. 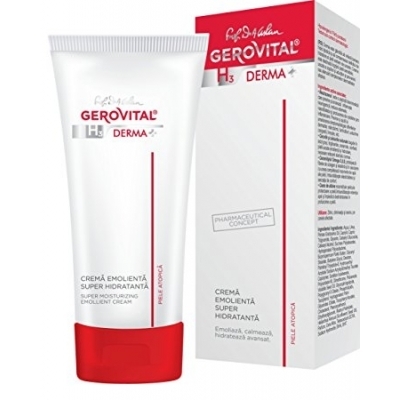 • Before using apply the suitable Gerovital H3 Derma+ moisturizer. 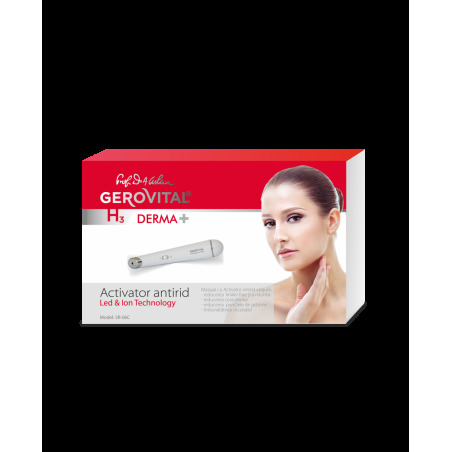 A slight tingling sensation associated with the usage of the activator it is a natural phenomenon. 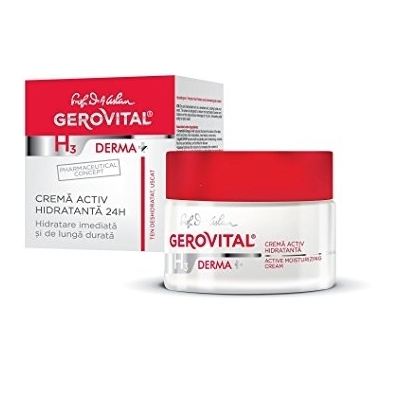 People with the following conditions should avoid using this device: allergic dermatitis, allergic sensitivity, sensitive skin or excessive level of sensitivity. Not recommended for people with the following conditions: heart disease, skin with acne, sunburned skin, pregnancy, unstable blood pressure. 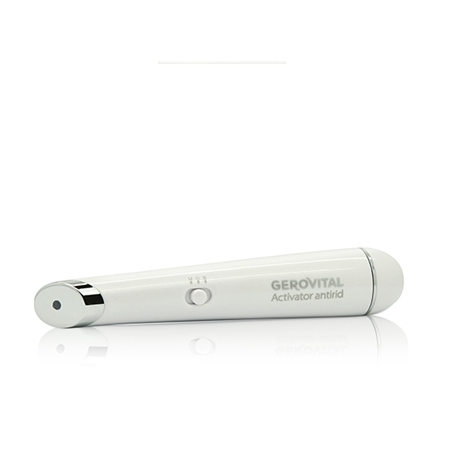 Wrinkle Activator works with 1.5V AA battery. This is not included in the package.